[Born 2010, Retired end of 2012] Have I mentioned how crazy busy things have been around here lately? I really gotta stop buying things that say "NEW!" on them. I want to be on the front lines of the latest and greatest freezer trends but man, there is just so much stuff out there right now. 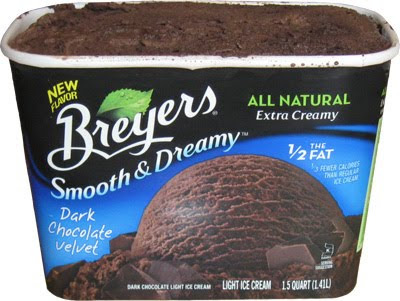 Case in point is one of the two new Smooth & Dreamy flavors from Breyers. I was pretty excited when I first saw this a few weeks ago, but I was good and waited until it was on sale. Well, sale week finally came so what we have here is the new Dark Chocolate Velvet Smooth & Dreamy ( extra creamy ) dark chocolate light ice cream. No chunks, no bits, no nothing, just ice cream. Now I wasn't expecting that. The ice cream almost looks as though it's a mix of two different flavors, one dark chocolate colored and the other a more milk chocolate color. This isn't billed as two flavors, and it doesn't taste like two flavors, it just looks like two flavors. To be fair and honest, I would like to preface the following statements by saying that this ice cream is all gone. That's right, our simple little dark chocolate friend did not stand a chance in the freezer. At a very unfilling 110 calories per serving, it was easy to make it disappear (you're going to need a nice big bowl to fill your belly). The first scooping was when we brought this home from the store. I will admit to having delusions of getting the flourless chocolate cake dark chocolate vibe in a very low fat format. Realistic? 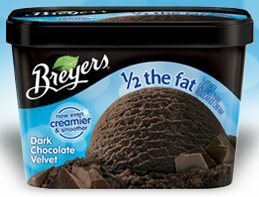 No, but hey, this is Breyers, so you never know what new flavor might win you over. Success? Nope, definitely not that strong a dark chocolate vibe. Sure, it's there, but it's not taking you to dark chocolate-ville, it's more like seeing the exit but you keep driving. You know it's there, you just aren't hanging around long enough to be truly satisfied. When they say this is a light ice cream, they mean super light. We were both still hungry when we were done. I understand that light ice cream isn't meant to be heavy, but I was just shocked that I didn't even feel remotely full. Boredom note: this ice cream is in bad need of a mix in. I know there are plenty of ice cream bits out there, and lots of people are purists, but I just think that some "low fat" tiny brownie bits or something similar would go awesome in the ice cream. Nothing too crunchy, don't want to ruin the soft texture of the ice cream here, but a nice soft (somewhat chewy) mix in would have been really nice. On Second Scoop: I went on to try the ice cream several more times. It's decent, and I have no problem recommending you give it a try, just don't set your hopes too high. Maybe it's best served with something else, I'm just not sure what, maybe it needs just the right kind of crushed cookie bits on top. If you are curious, the other new Smooth & Dreamy flavor is Coffee Fudge Brownie, but since I just can't seem to get into coffee ice creams, it won't be on the blog anytime soon. Oh, the last two servings went into a dark chocolate milkshake. Knowing that the ice cream melted quickly, I let it sit a little bit and then did my best to add as little milk as possible... after making a giant mess, I learned from my mistake and added a bit more milk. The good news is that this kept the flavor fairly strong, but the problem is that the dry nature of the dark chocolate flavor battles the milky refreshing-ness that you expect with a milkshake. It was kind of weird and just not something I would want to do to my tastebuds on a regular basis. 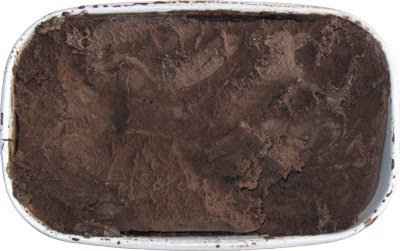 I wish more companies would try dark chocolate ice cream. The only one I've tasted/seen has been the Haagen Dazs(?) dark chocolate icecream that was limited edition last year but it appears it's been added to the main line. I loved it last year but I recently picked up a pint and I wasn't as much as a fan. Almost too thick/fudgy/rich for me and it melted very thick as well, I didn't like it for some reason. I believe they also have a LE dark chocolate mint now, so I'd like to try that. It definitely needs some mix-ins to cut some of the richness though . flavor in one of those small little single serving cups, and it was awesome! I don't even really like pb that much but I loved that ice cream..mmm. I've been craving it, and that almost never happens! Dark Chocolate Decadence without the calories !! Tried it today & loved it. True DCL prefer to have it ala carte....none of that fruity berry stuff or nuts.....And if you want some extra dark chocolate bits, why not just add it to the icecream yourself. This is the real deal...thank you Breyers !! I'm sorry to see the Dark Velvet Chocolate go. I was truly addicted to it, and then it was gone. It definitely was the closest to the Velvet Freeze Gold Coast Chocolate that I have found since they quit making it in the 1980's, (I think) I found this site doing a search for Gold Coast Chocolate.